New year, new start, as they say, although you’d be forgiven for feeling slightly less optimistic following the start the Dow has made to 2016. 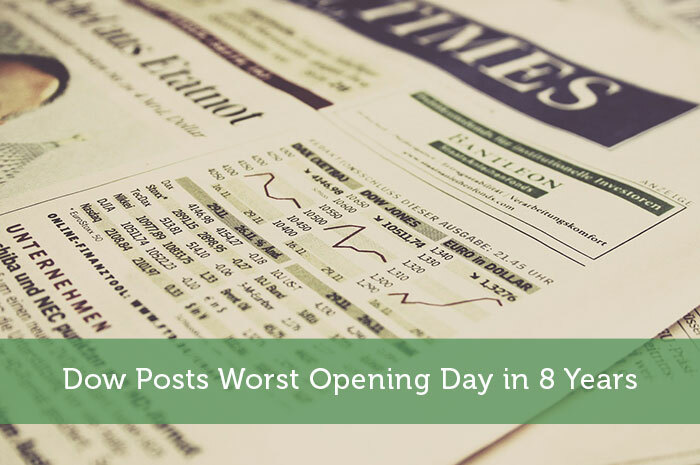 Traders were left reeling on Monday after the worst opening day in 8 years. At the end of 2015, most U.S. markets finished in the red. The S&P 500 was down 0.7% while the Dow hit a low of 2.2%. You’d have to look back to the financial collapse of 2008 to find poorer years for both indexes. Relatively speaking, the Nasdaq faired slightly better, posting a 5.7% increase at the end of the year, although it had enjoyed double digit gains in the three years leading up to 2015. Experts believe an overnight drop in Chinese stocks triggered a ‘circuit breaker’ (a measure used by stock exchanges during large sell-offs to avert panic selling) which further pressured U.S. stocks on their opening day of the new year. So what made 2015 a disappointing year for traders? It’d be easy to point fingers at Greece’s debt crisis and the European Central Bank’s stimulus plan, but it’s likely investors will point to other areas of volatility last year. There were three big concerns: the slowdown of China’s economy, falling oil prices and fevered speculation about when interest rates would be raised by the Federal Reserve. The latter in particular seemed to be a never-ending debate which finally ended on December 16th with a hike from 0.25% to 0.5%. However, those investors who spent last year betting on big tech stocks had a little more to celebrate. Netflix (NFLX) and Amazon (AMZN) both enjoyed a colossal rise of 115% while Google (GOOG) and Expedia (EXPE) gained 45%. Mark Zuckerberg’s Facebook finished 2015 up 34%, proving there is still an awful lot to be thankful for when it comes to technology and the stock market. It was a different story for building material firms, utility companies and big banks, all of whom finished last year down. Other stocks tumbled, too, with energy taking perhaps the biggest hit; names such as CONSOL Energy (CNX) and Chesapeake Energy (CHK) suffered falls of around 75%. There were similarly disappointing statistics for 2015 in the UK, where shares in the London stock exchange lost 5 % during 2015. And, with a national debt continuing to soar, U.S. investors would do well to keep an eye on that particular market this year, if China’s influence on the Dow was anything to go by. Ask traders how they think 2016 will pan out, and they’re likely to point to a harsh lesson learned in 2015, which is that markets continue to be very unpredictable indeed.